Enjoy the warmth of alpaca in a thin dress sock. Made of members' fiber in the USA. 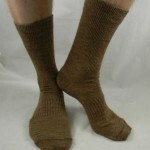 The socks have been test for washing and drying and are washer and dryer safe. Sizes 9-11 and 10-13 in brown and charcoal.